Making stategic improvements on your property before selling is the best way to increase value and your final sale price. 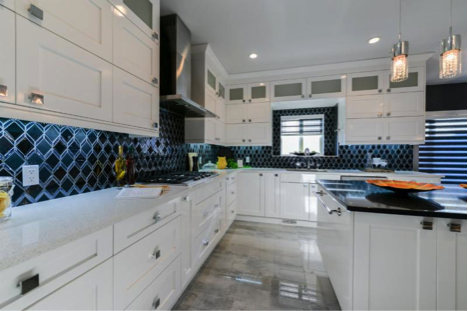 If your kitchen cabinets are still in good shape and less than 7 years old, then consider updating just the back splash to create a new wow factor that incorporates current finishes. This makes a big difference in the overall first impression of your kitchen, it’s like adding great jewellery to a pretty good dress, it really makes all the difference. Quick kitchen updates also include new handles, faucet and lighting. These don’t impact your bank account too much but do make a big difference. When deciding what to emphasize in your rooms, you will need to create the most square footage you can through a decent de-clutter of your home. Get a second opinion on this from a professional because often over the years we get comfortable in our own surroundings and we think everyone else is too. We need an objective outside opinion to help us see our home as a product on the market and not our home anymore. Create square footage by only keeping the furniture pieces that you need while you are for sale, so extra bookshelves, chairs, benches, ottomans, kids toys, dog beds, hutches, recliners etc…all need to be moved out. Make floor space this way, and create a visual of more sq ft. In addition to updates and proper pricing, Staging a home brings in better offers than not staging it, So clean, repair and stage your home, price it correctly with an Honest and Integrity based Agent, and get results. You will be glad you did! *** For Edmonton’s best project planning and contractor management, painting, fixtures updates, facelift renovations, and Staging. http://stageandsell.ca/ Jill Gargus 780-452-4527 Information Shared courtesy of "Simply Irresistible Interiors Inc." or Contact Myles Blewett 780-446-4643 and get his list of quality trades people and contractors. Your PROPERTY TAXES $HIGH$ ?? What is Real and what is Realistic? First, let me try and give you a brief understanding of the system in place (it’s not perfect and it is often very $$high$$). Governed by law for all Municipalities in Alberta, the tax man starts with the Market Value of a Property as of July 1st for the up coming assessment year (the next years assessment). Market Value as determined by your cities, towns, counties etc. as the current value that a property will reasonably sell for at that time and date, taking into account several factors like location, size etc. The Tax Assessors use a few sources of information, however it basically comes down to one thing. SALES at that time (around July 1st of previous year, the most expensive time of the year) within communities and areas. After which they apply this value to a formula(s) based on budgets and needs to basically come up with your property taxes. It is more complicated then that but a huge part of the process is the Assessed Market Value of a Property that determines what you pay. Market value can vary drastically within areas or communities. Why and How? For example: If the larger more expensive properties have sold recently within the area, then those averages are determined and applied to all properties in the area, resulting in perhaps a Market Value that is very high for many of the properties and now higher taxes for them as well. Most Tax Assessors for the municipalities do not have the time or man power to spend a lot of time researching each property to give a real accurate value and it’s all about collecting more tax dollars, right? More is better and if they can play on the emotions of people liking their home values high (who doesn’t like to see that? ), then it works for what they need to do and the result is you and I can pay too much. We all like to see our property values worth more $$$ and it’s very flattering to our egos to see that large number. I have had some of my clients tell me their properties are worth $100,000 more than what they are actually worth, because that is what their assessments had said. One thing is for certain - you want your home to be worth as little as possible in the eyes of the tax man!!! A Lesser value equals less Taxes!!! So I ask you, wouldn’t a more realistic number be better? I have seen this for years and have helped my clients save from a few $$Hundred$$ dollars to a few $$Thousand$$ dollars per year! There is a process to right this wrong! Yes it costs you a small fee (just so you don’t waste the Municipalities time of course). You can appeal the process for $50-100. Again, they do not have the time or man power in most cases to fight. So if you are reasonable and have the facts to back up your reduced values, you will likely end up paying less. My suggestion is if you are concerned about paying too much for your property taxes and feel your assessed market value is high then find out from a Realtor what the Real Market Value of your property is worth and use that to appeal your taxes (you have 60 days from the time you receive your assessment to start the process). I’ve personally helped my clients numerous times and they have had excellent results. Please keep in mind not all Tax Assessments are going to be worth fighting for the difference may not be great enough to make it worth while. We can find out very easily just give me a call 780-446-4643 or send me a message myles@mylesblewett.com . When Listing your home FOR SALE, are you showing it in the best possible light? Do you know where you are losing a buyer’s interest? Visual distractions are one of the biggest hindrances to a buyer being able to really see your home and it’s features. Excessive wall hangings, or having them incorrectly hung. Extra TV’s and DVD equipment and Gaming devices, DVD’s etc in excess. Don’t forget the seasonal decorations that weren’t taken down all year. Buyers eyes are already overwhelmed going into many people’s homes and trying to take it all in. Remember this: It all becomes a blur to buyers after a while and they will forget what they saw from home to home. You can stay top of their mind by taking care of all this prior to listing. Then your home is a breath of fresh air for them and they will fall in love with it, because THEY CAN SEE IT!! *** For Edmonton’s best project planning and contractor management, painting, fixtures updates, facelift renovations, and Staging. http://stageandsell.ca/ Jill Gargus 780-452-4527 Information Shared courtesy of "Simply Irresistible Interiors Inc."
WOW check out this new property just listed at 5905 189 ST in Edmonton. WOW check out this new property just listed at 934 HOPE WAY in Edmonton. Beautifully upgraded 2730 sq foot home in the desirable neighborhood of Copperwood in The Hamptons. Located on a crescent backing a treed walkway this timeless beauty will not disappoint. Gorgeous kitchen with corner pantry, plenty of cabinets and ample granite counter tops with eating bar. 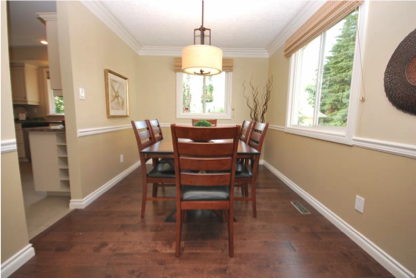 Open concept, spacious dining room and a main floor den, hardwood floors through out the main. Laundry/mud room area by entrance from the oversize garage. Upstairs you will find the spacious bonus room with built in speakers. Lovely big master suite with sitting area with a great view of the trees, nice to unwind after your busy day, and a five piece ensuite bath. Three more good size bedrooms complete the 2nd floor. Enjoy your sunny backyard with expansive deck and gazebo complete with awning and netting, step down to another stamped concrete patio. Smart wired CAT 5 through out, central air, aggregate drive and walkway. Beautifully landscaped. This home is a must to put on your list. WOW check out this new property just listed at 4527 211 ST in Edmonton. Open and bright 3 bedroom home on a truly amazing lot in the Hamptons. The home has a great open floor plan and all the extra windows you get with a corner lot; Large useable kitchen open to the great room; The upstairs has a large bonus room with custom built cherry wood wall to wall entertainment/cabinet unit and loads of space. Home security/ alarm system, security camera wired, heated garage, central air-condition/high efficiency furnace custom built huge walk in closet, built in RO water treatment system, The large corner lot is perfect for entertaining with the two tired deck with accent lighting gas hook up, good size trees, accent landscaping, fully fenced, includes a dog run, side access RV parking pad with 50 amp service. WOW check out this new property just listed at 20752 61 AVE in Edmonton. Welcome to this bright & spacious Daytona built 2 storey home in a great location within The Hamptons. As you walk in through the main entrance you get a true sense of the openness and superb layout of this home. The main floor consists of a living room with a NG fireplace, the Kitchen is equipped with SS appliances, eating bar & pantry, good sized mud room & Laundry, dining area with access to the deck and back yard that’s a perfect size for the kids. Upstairs you have a bonus room, 4 pc main bath, master with walk-in closet & 4pc ensuite & 2 more bedrooms. Downstairs is fully finished with a 4th bedroom being used as an office, 4pc bath with a steam shower, and a large great room. Other features of this home include, Air Conditioning, Hot Water on Demand, water softener, and a garage that's finished & equipped with 220V, plumbing (perfect for a wet bar), LED Heaters and can be easily transformed into your own special cave. WOW check out this new property just listed at 20704 90 AVE in Edmonton. Located on a cul de sac, close to shopping, services and the transportation depot, this beautiful very clean custom built bungalow by Homex is located on a 11,200 sqft pie shaped lot. The curb appeal is awesome with stone and a front porch plus the garage is huge 24'x31' feet! With vaulted ceilings in the main area plus master bedroom, a great room design, gleaming hardwood, granite, stainless appliances in a raised island kitchen with a huge walk through pantry, main floor den/dining room, smart wiring, built-in speakers plus too many other features to mention. This is a fantastic home for either empty nesters or a family. The lower level is accessed by a dramatic stairway and has a huge open area, wet bar, two bedrooms and a third bathroom. With central air, electronic air cleaner, underground sprinklers and more, it is just waiting for a new owner! WOW check out this new property just listed at 17389 8A AVE in Edmonton. Located in the prestigious Langdale area in Windermere, this spacious 3 bedroom and loft half duplex has tons to offer. With a double attached front garage, granite open concept kitchen, upstairs laundry and spacious pie shaped yard, partially backing onto the park, it offers more than most can. It also has a partially finished basement that could be an easy project to finish up to create even more space. Furthermore it has two and half baths, hard surface main floor and quiet street location, make sure you take a look! WOW check out this new property just listed at 3003 WATSON LANDING in Edmonton. Luxury at its finest! Stunning custom built Walkout Bungalow in Upper Windermere! This luxurious home features only the best in quality construction, high end finishings & materials throughout! You're welcomed by a grand foyer with 12ft ceilings and b/I waterfall opening into the bright living room with detailed led lit ceilings, a chef's dream kitchen with Wolf and Subzero appliances and a 12ft single slab island and butlers pantry, 4 bedrooms, 5 bathrooms (4 ensuites) , master suite w/7pc spa like ensuite w/steam shower & infloor heating, custom designed wardrobe room, fully finished walkout basement with a 200 bottle temp controlled wine room,wet bar, exercise room, stunning home theater room plus a covered private walkout patio. State of the art home automation, highend wideplank hardwood flooring and imported Italian tile,4 fireplaces, 2 heated patios, led lighting throughout, infloor heated basement & triple garage, custom landscaping w/waterfall/firepit. This one of a kind dream home is a must see! WOW check out this new property just listed at 2618 WATCHER WAY in Edmonton. Stunning 2 Storey in Upper Windermere!! Front foyer with view of reclaimed wood and stone base feature wall set the tone for this tastefully upgraded home. Modern 2 tone kitchen. Built in fridge matching cabinets, Built in S/S oven, microwave and dishwasher. Ceramic cooktop. Walk through pantry. Massive island. Dining space with access to backyard patio. Living area with 18 foot ceilings and fireplace. Den with barn doors, Laundry room, 2 pce bath and garage access complete the main floor. Spa like master suite. Huge walk through/in closet. 6 pce en-suite contains fire place, large tub, his and hers shower, double vanity and heated floors. 2 bedrooms, 5 pce bathroom with double vanity and spacious bonus room finish second floor. Quartz counters, Pot lights and custom lighting throughout. Loads of natural light. Built in sound. Nu-Air, High efficiency HWT and Furnace. Access to Upper Windermere’s private recreation facility. Close to schools, shopping and transportation. This home is a must see! !